I haven't found any related info or guideline, so this could be only documentation related. Install @nuxtjs/markdownit, follow the instructions to inject text as laid out in its README, and include some HTML in the markdowned text. HTML tags are rendered literalIy, at least, the ones I have in my text, namely span and cite. It would be nice if we have a option to enable/disable the debug mode instead of turning NODE_ENV to production. I make project using Universal option. When I inspect the page, the bootstrap css tag does not appear. Anyone have any idea what I can do to fix it? idea google-tag-manager does not add noscript to body element. 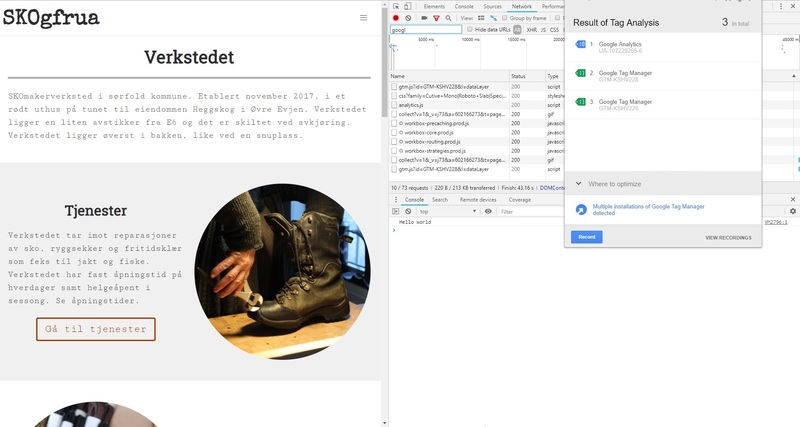 Install Tag Assistant (TA) and visit the reproduction link (it's a live site in Norwegian, but it shouldn't matter for testing). Use TA to view status of containers being loaded. Navigate on the site and watch the number of installations go up, and TA giving a warning of multiple installations being detected. Every other or so page navigations, as well as reloading the site, bumps this number. Google Tag Manager should only be loaded and installed once on page load(? ), then run as normal on page navigations. (? )*) This is my first time using GTA, not too sure about the specifics here. But seeing as the site uses nuxt generate, which loads the first proper HTML file, then runs as an SPA, correct? GTM is fetched twice and the is installed several times over on page navigation and page reloads. An unrelated(?) issue is network tab showing GTM js being loaded after on page load and first on the first page navigation, but then nothing. Is this intentional and could it be related? However on consecutive page loads after page navigation number 1, it doesn't fetch it any more, but the number of installations keep going up. Using nuxt generate for publishing and nuxt-link for internal navigation. 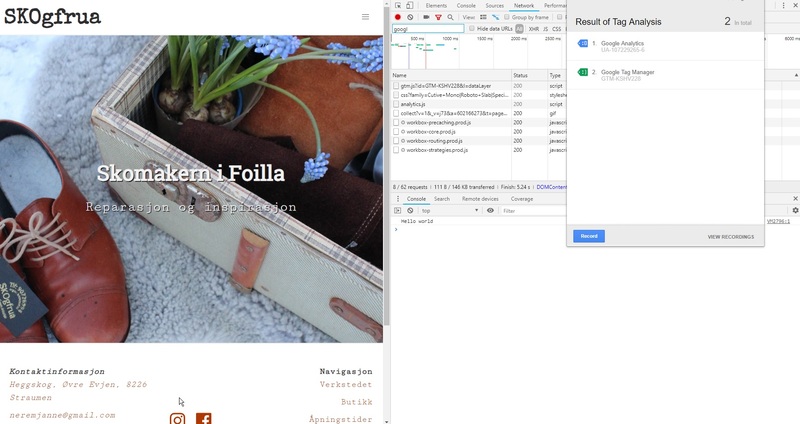 Side note: adding the generated script tag from Google to app.html head seems to work as expected (tested locally). Of course this would not give me the opportunity to track page views without custom code, but since I'm using GA module, which works fine for page view tracking, is this a good alternative/temp fix? It should be mentioned that this is my first time ever installing GTM, so I'm not sure what consequences this might have for the site? I did test pageview, link click and history change tag triggers, and all working fine and only firing once. Any input, insight etc. is greatly appreciated! Cheers! I successfully added Google Tag Manager to my nuxt project. I added Google Analytics into my Google Tag Manager Container and I can see the first loading of the page in Google Analytics. If I click on a router link (To display a new page) This page is not tracked in Google Analytics. Is it possible to import single components of Vuetify with A La Carte? I did try with plugins before and then vuetify-loader but nothing seems to work. I don't have any clue as why this sin't working. Incorrect: See component-level caching for mor information. Correct: See component-level caching for more information. Question: Is it possible to use some module in this package with typescript and eslint|tslint? Basically create a project choosing vuetify as the framework. Then, run yarn run dev and wait for the server to start. When it has started reload the page several times, you will see that the toolbar changes its size, bumping. The toolbar should not change its size. The toolbar changes its size. Hi, how is it possible to use the built-in vuetify translations (like for datatables) https://vuetifyjs.com/en/framework/internationalization#vue-i18n with nuxt? I'm using @nuxtjs/vuetify and nuxt-i18n, all latest. Vuetify and i18n by itself work perfectly fine. https://www.npmjs.com/package/@nuxtjs/optimize is obsolete but still normally listed on NPM. I'm trying to simply install the @babel/polyfill and intersection-observer polyfills on my nuxt app and keep running into different bugs. I've looked all over for instructions and answers but can't find anything that's solved. I used npm install to install @babel/polyfill and intersection-observer. Any suggestions on what I've done wrong or what I need to do to implement the @babel/polyfill and intersection-observer polyfills?